meantime is that two weeks ago President Obama opposed a no-fly zone and today he supports it. 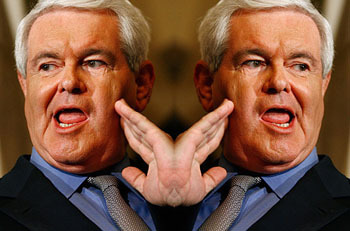 So Gingrich is consistently taking the anti-Obama position, whatever that happens to be. Well, whatever. With Obama being a socialist tyrant out to destroy America and all, anti-Obamaism is pretty much the state religion of Republicans these days. But I always kind of wonder what these guys are thinking when they do such an obvious and public U-turn. Do they think no one is going to catch them? Or do they not really care because they don’t think the public really cares? I think it used to be the former, but has lately become mostly the latter. Back in the day, I remember a lot of people saying that it was getting harder for politicians to shade their positions — either over time or for different audiences — because everything was now on video and the internet made it so easy to catch inconsistencies. But that’s turned out not to really be true. Unless you’re in the middle of a high-profile political campaign, it turns out you just need to be really brazen about your flip-flops. Sure, sites like ThinkProgress or Politifact will catch you, and the first few times that happens maybe you’re a little worried about what’s going to happen. But then it dawns on you: nothing is going to happen. Your base doesn’t read ThinkProgress. The media doesn’t really care and is happy to accept whatever obvious nonsense you offer up in explanation. The morning chat shows will continue to book you. It just doesn’t matter. And that’s got to be pretty damn liberating. You can literally say anything you want! And no one cares! That’s quite a discovery.